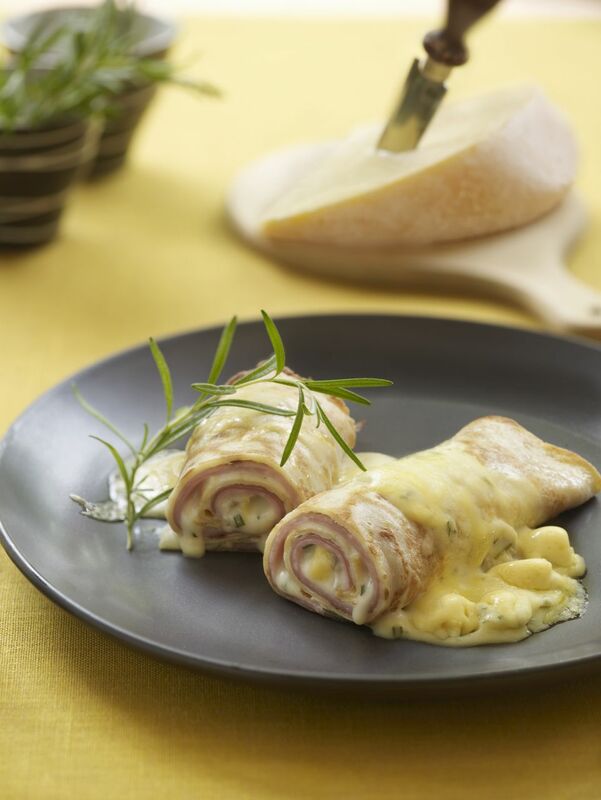 These ham and cheese crepes make a nice dish for a brunch, lunch, or dinner. Use homemade crepes or buy ready-made crepes. Although crepes are thinner and more delicate, they're as easy to mix and cook as pancakes. If you are making crepes from scratch, plan to make the batter at least an hour ahead of time and let it rest in the refrigerator. If making crepes from scratch: in a blender, process the eggs with milk. Add the flour, 4 tablespoons of melted butter, and 1/2 teaspoon of salt. Blend until the batter is smooth. Pour into a container, cover, and let stand for 1 hour or refrigerate for up to 12 hours. Grease skillet or crepe pan (7 to 9 inches in diameter) lightly; heat until fat is sizzling hot. Pour about 3 to 4 tablespoons of batter (depending on how thin you would like them to be) into the pan and rotate it quickly to distribute batter. If the batter seems too thick, add more milk in very small amounts until the consistency is thin enough to pour. Cook the crepe until the bottom is light brown; flip it over to cook the other side. With a spatula, remove the crepe from the pan. Lightly grease the pan and repeat until there is no more batter. As you remove the crepes from the pan, stack them on a plate and cover them with a clean kitchen towel until all are cooked. Heat the oven to 350 F. Sprinkle each crepe with 2 tablespoons of shredded cheese; top each with ​a ham slice. In ​a small bowl, combine the onion, 1/2 teaspoon of salt, pepper, sour cream and mustard; mix well. Spread about 1 tablespoon of the sour cream mixture over ham. Roll up and arrange in 9-by-13-by-2-inch baking pan. Combine 3 tablespoons of melted butter and breadcrumbs; sprinkle over crepes and cover pan loosely with foil. Bake in the preheated oven for 15 to 20 minutes, or until cheese is melted. Serve crepes immediately.